Selection of imported olives marinated, fennel seeds and fresh herbs. Cured and aged beef rolls stuffed with arugula and fresh ricotta cheese. Typical Sicilian dish made with eggplant, olives, celery, capers, onions, and tomatoes. Our signature dish. Fresh mozzarella cheese with prosciutto di parma and Sicilian pesto. Fried calamari and zucchini served with a spicy marinara sauce. Saffron rice ball stuffed with bolognese meat ragout, green peas, and tomato sauce. Our signature dish. Fresh mozzarella cheese, sliced tomatoes, basil, roasted peppers and Sicilian extra virgin olive oil. Homemade potato croquettes filled with fresh mozzarella cheese "panzarotti" style. Trio bruschetta's roasted peppers, mozzarella cheese, tomato basil-pesto, caponata. Traditional Italian veal meatballs recipe served with marinara sauce and melted provolone cheese. Our signature dish. Grilled hot calabrese sausage with grilled bell peppers and onions, topped with melted provolone cheese. Thinly sliced beef, topped with rucola, shaved parmesan cheese, drizzled extra virgin olive oil. Tomato rice ball stuffed with eggplant, mozzarella cheese, tomato sauce and basil. Our signature dish. Traditional Italian vegetarian soup with beans, carrots, celery, potatoes, tomatoes, onions and ditalini pasta. Romaine lettuce tossed with focaccia croutons, shaved parmesan cheese, creamy caesar dressing. Baby arugula with fennel, green apples, marinated onions, lemon zest, shaved parmesan cheese, caramelized walnuts, lemon and balsamic dressing. Spring mix, radicchio, cherry tomatoes, arugula, lemon, extra virgin olive oil. Tuna in extra virgin olive oil, green beans, cherry tomatoes, capers, potato, castelvetrano olives, red onions, celery, oregano, red wine vinaigrette dressing. Our signature dish. Mix green salad, cherry tomatoes, roasted peppers, balsamic vinaigrette dressing. Spinach salad with red beets toasted almond, goat cheese and lemon-oregano dressing. Organic baby kale with Kalamata olives, red and yellow peppers, onions and garbanzo beans. Choice of three cured Italian types of meat and cheeses. Choice of five cured Italian types of meat and cheeses. Choice of seven cured Italian types of meat and cheeses. Tomatoes, garlic, olive oil, oregano. Tomatoes, basil and mozzarella cheese. Tomatoes, mozzarella cheese and spicy salami. Tomatoes, mozzarella cheese, sausage and green peppers. Tomatoes, mozzarella cheese, arugula, parma prosciutto and shaved parmesan cheese. Tomatoes, mozzarella cheese, artichokes, mushrooms, olives and cooked ham. Tomatoes, mozzarella cheese, jalapenos, sausage, red peppers. Olives, mozzarella cheese, artichokes, peppers, mushrooms. Bianca Del Diavolo Pizza 12"
Ricotta cheese, mozzarella cheese, spicy salami. Bianca Del Diavolo Pizza 18"
Bianca Del Diavolo Pizza 29"
Speck, mushrooms, mozzarella cheese, truffle cream. Parmesan, gorgonzola, brie, mozzarella cheese. Mozzarella cheese, parma prosciutto, artichokes. Mozzarella cheese, mushrooms, truffle oil. Gorgonzola and mozzarella cheese, potatoes, oregano. Gorgonzola & mozzarella cheese, potatoes, organo. Tomatoes, imported buffalo mozzarella cheese, basil. Cherry tomatoes, imported buffalo mozzarella cheese, basil. Baked pasta with light bechamel, Italian meat sauce and parmesan cheese. Baked pasta with light bechamel, spinach, mushrooms, zucchini, eggplant, carrots and mozzarella cheese. Tomato sauce, pancetta (Italian bacon), onions, red pepper flakes and pecorino cheese. Tomatoes, garlic, artichokes, black olives, capers and crushed red peppers. Rolled baked pasta stuffed with mushrooms, veal and ricotta cheese and served with mushroom sauce. Rolled pork belly slowly cooked with wild herbs and spices, sauteed red cabbage, Italian salsa verde with roasted potatoes. Classical eggplant parmigiana with fresh tomatoes, basil and mozzarella cheese. Chicken paillard with roasted potatoes and mix green salad. Sashimi grade seared yellowfin tuna served with green peppers, basil, mint, parsley, lemon Sicilian couscous. Typical Sicilian dish made with eggplant, olives, celery, capers, onions and tomatoes. Our signature dish. Saffron rice ball stuffed with bolognese meat ragout, green peas and tomato sauce. Our signature dish. Caesar style, organic romaine leaves with capers and parmesan vinaigrette dressing with focaccia croutons and shaved parmesan cheese. Organic cherry tomatoes, Albacore tuna in extra virgin olive oil, green beans, capers, potatoes, castelvetrano olives, red onions, celery, oregano, red wine vinaigrette dressing. Our signature dish. Organic baby kale with Kalamata olives, red and yellow peppers, onions and garbanzo beans with vinaigrette dressing. Belgium endive, walnuts, fennel, goat cheese, bosc pears, organic honey vinaigrette dressing. Tomatoes, mozzarella cheese, arugula, basil pesto, roasted peppers, balsamic vinaigrette dressing. Parma prosciutto, fresh mozzarella cheese, tomatoes, basil, arugula, chipotle aioli. Grilled eggplant, roasted bell peppers, hummus, Kalamata olive spread. Numero 28 meatballs, tomato sauce, basil, melted mozzarella cheese. Our signature dish. Roasted pork belly, arugula, provolone cheese, chipotle aioli. Our signature dish. Italian sausage, onions and bell peppers gratinati dijon mustard, fontina cheese. Grilled chicken, mozzarella cheese, vine-ripened tomatoes, red onions, fresh basil and chipotle mayo. 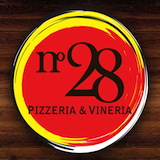 Bianca Del Diavolo Pizza Lunch 12"
Bianca Del Diavolo Pizza Lunch 18"
Bianca Del Diavolo Pizza Lunch 29"
Numero 28 Pizza Lunch 12"
Numero 28 Pizza Lunch 18"
Numero 28 Pizza Lunch 29"
4 Formaggi Pizza Lunch 12"
4 Formaggi Pizza Lunch 18"
4 Formaggi Pizza Lunch 29"
Gorgonzola and mozzarella cheese, potatoes. Baked pasta with light bechamel and Italian meat ragout, parmesan cheese. Our signature dish. Baked flat pasta with, spinach, mushrooms, zucchini, eggplant, and carrots. Classical eggplant parmigiana with fresh tomatoes, basil and mozzarella cheese. Our signature dish. Lady's fingers dipped in espresso, mascarpone cream cheese, cocoa powder. Tube-shaped shells of fried pastry dough, filled with sweet cream ricotta with chocolate chip. Cooked vanilla cream topped with mixed berry sauce.